Hey guys! I hope you're doing well! I really am exciting to be interviewing indie polish creators. We've seen so many new nail trends because of them & I can't wait too see what they have in store for us next! Since indie polishes are very popular right now I figured there's probably a lot of customers/fans who would love to get to know the person behind all their favourite creations. So that's what I'm going to be trying to help you do! My name is Chrissy, I'm a dog person, but due to my son's allergies we can only have cats. I also am married and have two sons in college. What is your nail polish brand & how did you come up with the name? 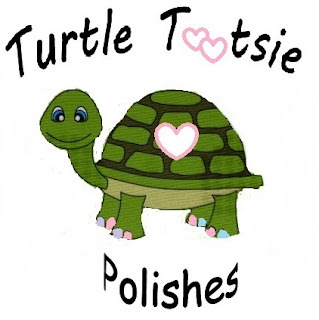 My brand is Turtle Tootsie Polishes. I love turtles and wanted to go with a "cutesy" label, so that's how the idea popped up! What year did you start your brand & what motivated you? I opened in July of 2015 after almost 2 years of testing. I was motivated by battle with breast cancer. Once I beat the cancer, I decided I wanted to do things that make me happy. Life is short. I loved making polish, so I went for it! My first polish was called "Silver Bracelets", it's still available. When creating a new polish, what's your inspiration process? It depends, sometimes it's seasonal, sometimes they just come to me. What is your all time favourite polish that you created? Oh boy, this is a tough one. My current favorite polish is called "Is There Sugar In Syrup" which is from my holiday ELF collection. From your personal experience what are some pros & cons to being a indie polish creator? The cons: It's expensive, sometimes collections don't sell and well, it's alot of work. Where is your brand based? Do you ship internationally? I'm based in Schnecksville, Pennsylvania which is about an hour North of Philadelphia and yes, I do ship internationally. What's your favourite mainstream brand? What's your favourite indie brand? My favorite Indie brand is probably a tie between 77 Nail Lacquer, Smokey Mountain Lacquers and Pipe Dream Polish. All 3 makers are incredibly sweet woman and their polishes are fabulous! I'm still fairly new to the Indie scene and I take great pride in my work. All of my polishes are put through a testing process so that you receive quality polish. I also carry cuticle oils, lip balms, soaps and sugar scrubs.